DETROIT -- Ford Motor Co. had more to crow about today, a week after posting a $2.1 billion quarterly profit: U.S. sales rose 25 percent in April, higher-profit retail volume advanced more than fleet, and Ford again outsold Toyota Motor Corp. to solidify its No. 2 perch. Good results come from consistently matching production to market demand, Ford executives said during a conference call. 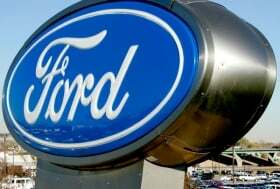 Sales boss Ken Czubay outlined a broad range of good news for Ford in sales numbers, from five straight months of increases topping 20 percent to higher transaction prices. "Sticking to our consistent [production] strategy and adding value in products is the key," he said. Ford sales excluding Volvo rose 26 percent to 162,737 light vehicles in April. Counting a 1 percent gain from the Swedish brand, which is about to be sold, overall sales were up 25 percent. That's slightly higher than Toyota Motor Sales U.S.A.'s 24 percent gain in April. Ford outsold Toyota by almost 10,000 units for the month, widening its lead. If Ford can maintain the trend over the rest of the year, it would retake the No. 2 position it ceded to its Japanese rival in 2008. Ford retail sales rose 32 percent in April while fleet sales gained 13 percent, said chief sales analyst George Pipas. Fleet sales were 32 percent of Ford's total sales. About 40 percent of those sales were to daily rental customers, with commercial and government fleets making up the rest, Pipas said. Ford accompanied last week's quarterly profit with a forecast of a "solid profit" for 2010. Ford lost money from 2005 through 2008. The automaker last year boosted its U.S. market share for the first time since 1995.